IMMOBILIZATION SYSTEM FOR SRS, SBRT AND MORE. 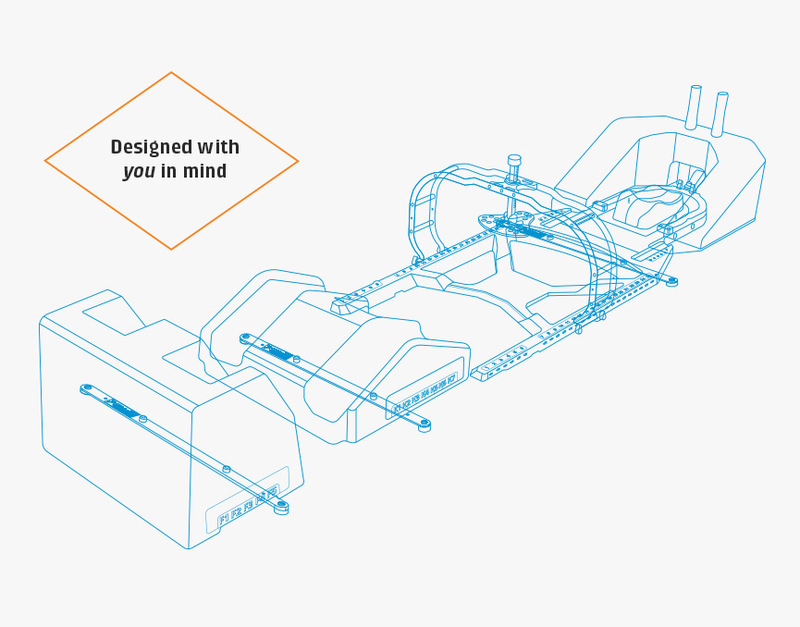 The FreedomX™ is a modular-based precision patient positioning system that is directly indexed to any treatment couch. With eight indexable modules that accurately position your patient in the two primary supine configurations, Arms Up or Arms Down. 1 comprehensive system, 8 highly designed modules. Hover over the blue circles for additional information. The FreedomX™ Comprehensive Overlay is the foundation of the FreedomX™ System and has been engineered with you in mind. At 1.7kg/3.8 lbs, this low density overlay weighs less than a bag of sugar but is as strong as steel. Compatible with all treatment couches using the corresponding indexing bar, the FreedomX™ Comprehensive Overlay is a true precision centric patient positioning system. 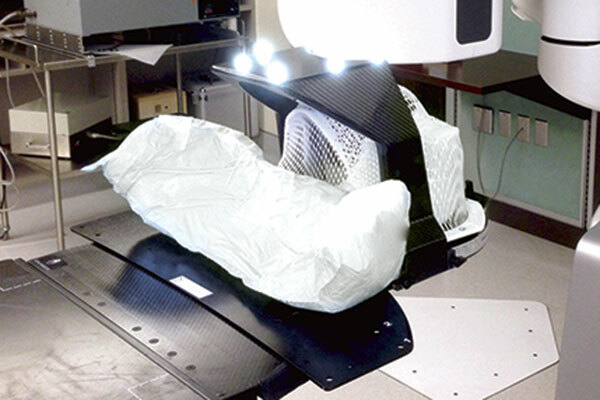 Includes: LB-SBRT-X, SBRT-FILL-X, CFJ02, couch specific carbon fiber index bars 1 pkg. 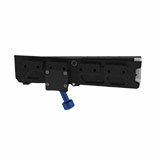 LB-SBRT-WM Wall Mount Storage Solution 1 ea. LB-SBRT-X FreedomX™ Comprehensive Overlay 1 ea. 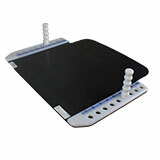 SBRT-FILL-X FreedomX™ Integrated Table Pad 1 ea. CFJ02 5-Point Tension Lock Immobilization Clamp 1 ea. RS02 Shoulder Retractors 1 ea. IB06* Type Radio-translucent Indexing Bars 2 ea. *Note: contact your sales representative to determine the correct part code for indexing bars that match your couch. ViewRay and MRidean is a trademark of ViewRay Inc.
As well as Cranial SRS or Head & Neck treatments, the FreedomX™ System can be configured for SBRT type treatment using several additional components that attach and index in conjunction with the FreedomX™ Comprehensive Overlay. Designed to utilize Vacuum Lock™ cushions, the FreedomX™ System can be manipulated to ensure your patient is extremely comfortable while giving you the highest levels of precision in SBRT patient positioning. The FreedomX™ System is easily configured for Arms Up or Arms Down ensuring your patient will be as comfortable as possible. Includes: AU-3, KN1-WDG-1, F-WDG-1, SBRT-BS-X, SBRT-BL-X, CMP-S, CMP-L, IB06 type Indexing Bars x2 (specify couch). 1 pkg. The FreedomX™ Spine-Align Module adds new functionality to our proven low attenuating Carbon fiber bridges. With Spine-Align you have the functionality of side compression paddles ensuring your patient is aligned and indexed centrally and reproducibly at simulation and in every treatment. A particular benefit of using Spine-Align is that any lateral corrections based on an initial scout image will now be much faster to correct, assisted by the functionality of Spine-Align. This allows for significantly faster patient setup and unmatched patient immobilization throughout initial patient setup at Simulation and for each treatment fraction. When you use Spine-Align it’s as though your right there firmly holding your patient exactly where you need them at all times. AU-3 FreedomX™ Compatible Arms Up Module 1 ea. 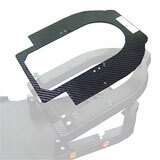 SBRT-BS-X FreedomX™ Indexable Carbon Fiber Bridge – Small – fitted for abdominal comp 1 ea. 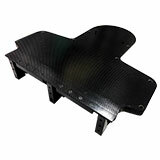 SBRT-BL-X FreedomX™ Indexable Carbon Fiber Bridge – Large – fitted for abdominal comp 1 ea. CMP-S FreedomX™ Xiphoid process Compression Assembly – Small 1 ea. CMP-L FreedomX™ Xiphoid process Compression Assembly – Large 1 ea. 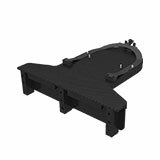 SBRT-BS-SP1-X FreedomX™ Indexable Carbon Fiber Bridge – Small – fitted with Spine-Align 1 ea. 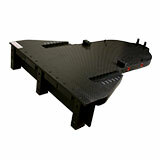 SBRT-BL-SP1-X FreedomX™ Indexable Carbon Fiber Bridge – Large – fitted with Spine-Align 1 ea. SP1-M FreedomX™ Spine-Align paddle configured with shorter post 1 ea. 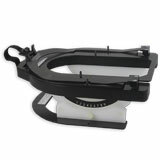 AAS03 Adjustable Support Strap 1 ea. KN1-WDG-I FreedomX™ Knee Positioner – Indexable in 7 positions 1 ea. F-WDG-I FreedomX™ Foot Positioner – Indexable in 5 positions 1 ea. AU-3-SA FreedomX™ Standalone Arms Up module, indexes directly to most couches. Contact your sales representative for couch compatibility 1 ea. Improve the performance of the most accurate SRS immobilization solutions with the addition of the Hand Indexer and/or the Shoulder-Tech Modules. LB-HP Arms Down Hand Indexer (specify couch) 1 ea. Hover over the blue circle for additional information. Improve the performance of the most accurate SRS immobilization solutions with superior patient comfort with the addition of the Shoulder Tech Module. STA-12 Shoulder-Tech – compatible with LB-SBRT-X, LB02 & SB02 1 ea. The Mask Stabilization Systems is an optional add on that provides additional rigidity and stabilization to meet immobilization protocols that are looking for absolute rigidity. Often used when optimal posterior support is not the focus. This system attaches directly to an immobilization mask and illuminates the need for an invasive bite block system as a means to enhance patient immobilization. Both the Wishbone Stabilizer and Intuition Stabilizer index directly to all FreedomX™ Overlays and Couch Extensions using our proprietary LT-Thermoplastics Quick-Attachment process. Both open and closed face masks can be used with FreedomX™ Mask Stabilization System range. NWB02-MM Intuition Mask Stabilization System – shaped for use with Intuition 1 ea. 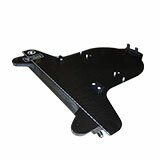 NWB02 Wishbone Mask Stabilizer System – shaped for use with Intuition 1 ea. NWB02-QA Quick Attach Slices x 12 /package 1 pkg. IFF03 Instaform™ Kit – Standard 4 ea. IFF03-B Instaform™ Kit – Large 4 ea. IFF03-D Instaform™ Kit – Extra Large 8 ea. IFF03-E Instaform™ Kit Treble Size (8 Kits/ Case) 6 ea. The Intuition Click™ provides a system to produce a fully customized, non-invasive positioning solution that provides full support to a patients head, C-spine and shoulders, right up to the coronal plane. Combined with either a closed mask or open-face mask, the Intuition Click™ has been shown to better the performance of the most accurate SRS immobilization solutions with superior patient comfort. Includes: MM14-IF, MM14-IR, LB-HP, STA-FILL-X, STA-12 & THS03-MM 1 pkg. Includes: MM14-IF, MM14-IR, STA-FILL-X, & THS03-A-MM 1 pkg. MM14 Intuition Click™ for custom Head, Neck & Shoulder molding 1 ea. MM14-FI Intuition Click™ Frame Replacement Foam Kit 1 ea. MM14-IR Intuition Click™ Risers – for use with F size tall head supports 1 ea. STA-FILL-X Intuition Click™ Adapters – for use in cranial SRS Set-up only 1 ea. LB-HP FreedomX™ Arms Down Hand Indexer – configured to couch 1 ea. The FreedomX™ Couch Extensions provide a rigid and lightweight platform for an unobstructed 360º treatment of a patient’s head and neck. Our couch extensions feature integrated pitch adjustability which can be combined with the FreedomX™ Roll Adapter (BM02-T) giving simple and precise adjustment for pitch and roll. 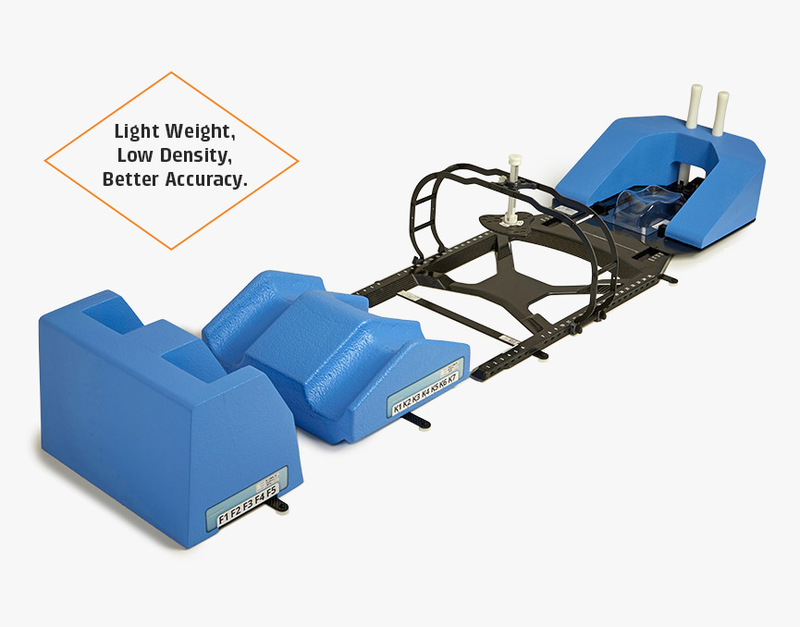 The Pitch and roll provided by the FreedomX™ Couch Extension combined with yaw from your couch provides a full 6-axis adjustability for patient position correction based on Cone Beam image verification and/or Surface Image Guided Radiation Therapy (SIGRT or SGRT). Head & Neck Extension with integrated pitch. Compatible with Varian, Elekta and others couches. Cranial Couch Extension with integrated pitch. Compatible with Varian, Elekta and others couches. with integrated pitch. Optimized for Elekta couches. FreedomX™ Arms Down component for use with FreedomX™ Couch Extensions. For use with S-Type masks for Cranial SRS or Head & Neck. Head & Neck Extension compatible with BrainLab, Elekta iBeam or Connexion. Includes: SB02, SB02-S1, BM02-T, SB-HP (couch specific), STA-12 & optional THS03-MM 1 pkg. Includes: SB02-S1, BM02-T & optional THS03-MM 1 pkg. Includes: SB02, BM02-T SB-HP (couch specific),STA-12 & optional THS03-MM 1 pkg. The FreedomX™ Compression Belt is an easy to use pneumatic abdominal compression system for managing movement and tumor motion while maintaining maximum comfort to the patient. The belt can be used in conjunction with the SBRT modules of the FREEDOMX™ System, SaBella Flex™ or as a standalone device for your existing system. Includes: Small & Standard Compression Belts and Sphygmomanometer 1 ea. Include: Standard & Large Compression Belts and Sphygmomanometer 1 ea. Includes: Small, Standard & Large Compression Belts and Sphygmomanometer 1 ea. 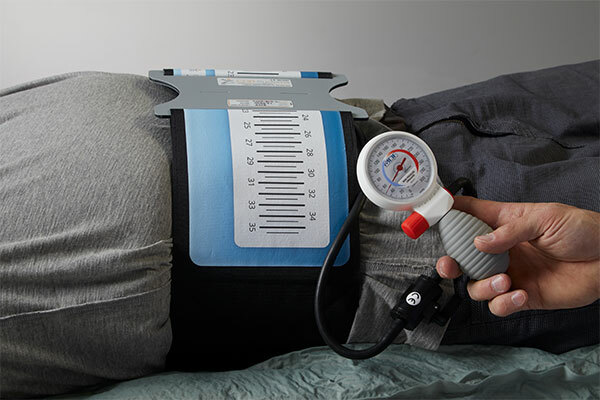 COMP-SPG Freedom™ Compression Belt Sphygmomanometer 1 ea. The Aeris Array™ is compatible with BrainLab’s ExacTrac® system to verify FreedomX™ 6 axis (X,Y,Z, Pitch, Roll and Yaw) couch extension adjustments for Frameless SRS treatments. > The AuraSphere™ is a marker used with the Aeris Array™ to advance a patients’ corrected position to the utmost precision. They are threaded, retro-reflective and compatible with BrainLab ExacTrac®* system. BL-A Aeris™ Positioning Array for BrainLab ExacTrac® System 1 ea. BL-AS1 Aeris AuraSphere™ for BrainLab ExacTrac® System 1 ea. PH08 set up for supine cranial treatment on the FreedomX™ Overlay showing adjustments for c-spine curvature. For additional information in accessories and components download our catalogue.